As the end of October nears, a five-month long fire season - one of the worst on record for northern Idaho - slowly cools off. The Idaho Department of Lands (IDL) and two timber protective associations have been fighting fire since May and are still mopping up fires this week. Together we have put out close to 300 fires that burned75,000 acres, racking up close to $80 million in fire suppression costs - about $60 million of which Idaho taxpayers will pay. Fire managers are still encouraging the public to report fires as soon as they see smoke. Nearly half the fires we fought were human caused. The total number of fires on lands protected by the State of Idaho was a fairly typical 89 percent of the 20-year average, while the number of acres burned was huge - 594 percent of the 20-year average. The vast majority of wildfires are put out before they reach ten acres. However, but the fires that escape initial attack cost taxpayers the most money to suppress. That's particularly true when the fires require the use of an incident management team. Fourteen IDL fires required the use of 27 incident management teams. The teams are interagency groups of fire management professionals specially trained and experienced in managing complex wildfires. Agencies order a team when a fire escapes initial attack and is expected to exceed the agency's local district resources. There are high costs associated with the use of Type 1 and Type 2 incident management teams. The largest, most expensive fires were the Clearwater Complex fires thatdestroyed 48 homes and 70 other buildings near Kamiah in Idaho County in August. Those fires cost more than $25 million to suppress and burned more than 68,000 acres. A total of 63 residences and 79 other structures were lost this year in fires fought by the State of Idaho. Approximately 740,000 acres burned across the state in 2015, nearly 80 percent owned and managed by the U.S. Forest Service and Bureau of Land Management, Idaho's two largest land managers. Approximately 28,000 acres of endowment lands managed by IDL burned. Of that, 7,000 acres of endowment timber land burned, creating opportunities to make more money for public schools through 15 planned fire salvage sales that will produce 88 million board feet of timber and 5,500 acres of regenerated forests into the future. The other 1,500 forested endowment lands that burned are too rocky and steep or hold minimal volume to be cut and then replanted. Fourteen of the 15 IDL fire salvage sales will be sold by the first of the year and harvest operations already have started on one of them. 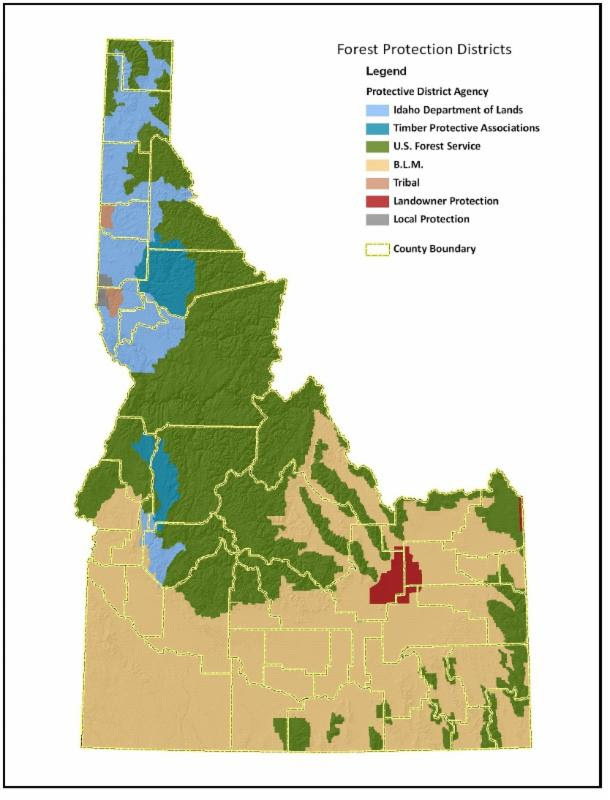 There are 53.5 million acres of land in Idaho divided into 14 forest protective districts. (shown in shades of blue on map). The U.S. Forest Service and Bureau of Land Management (BLM) protect the largest acreage in Idaho. Six recently established rangeland fire protection associations assist the BLM with initial attack. More than 200 local and rural fire districts provide structure protection in non-urban parts of the state.